By the late 1950’s, the infrastructure of the automotive industry had begun a transformation from the monopolistic business of a few, large, corporate giants to a much more competitive and highly segmented marketplace. A few small, relatively unknown companies from Europe were emerging, presenting competitively priced alternatives to the current American offerings, catching companies like Ford and General Motors completely by surprise. Volkswagen had introduced the Beetle and confounded the competition by selling 200,000 or more units per year. The introduction of this, and other “cheap” cars into the automotive market would forever change the direction of automotive marketing and would directly impact the future of the Corvette. Despite the fact that the Corvette had yet to be profitable, General Motors management was certain that the design changes that Harley Earl had implemented in his 1956 redesign would continue to be the basis of design for future model years. 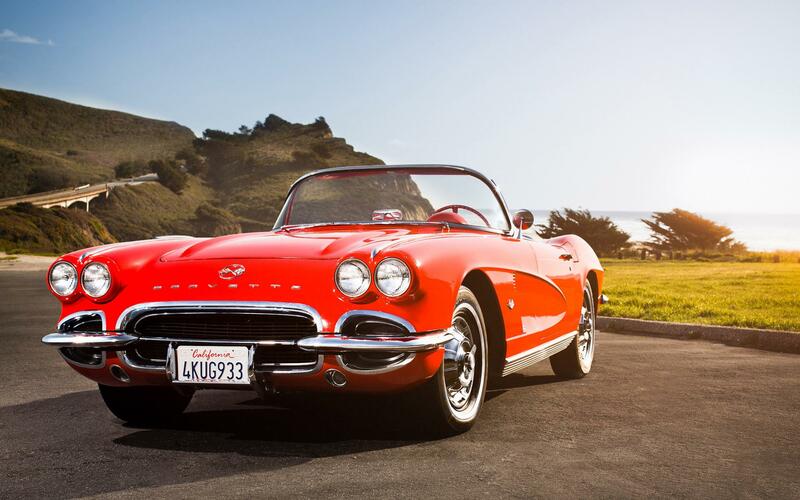 Certainly, the 1957 Corvette had shown considerable improvement in it’s numbers over the 1956 model year and, if things continued to move in that same direction, the Corvette would certainly meet financial success in the coming year. 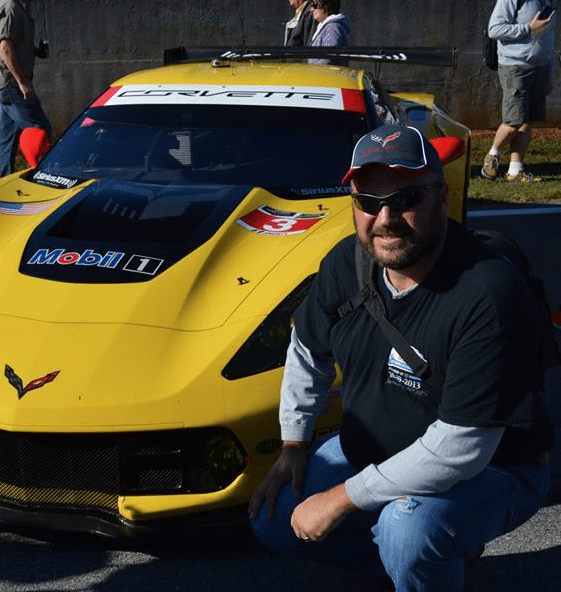 In addition, Corvette had managed to completely dominate on the racetrack and, despite the fact that General Motors would join others in observing the racing ban that had been put in place by the Automobile Manufacturer’s Association (AMA), it had proven nearly unbeatable in it’s class. It is commonly believed that the Corvette had performed so well in open competition throughout 1957 that it had forced Ford to “throw in the towel” on it’s two-seater Thunderbird, forcing them toStill, GM engineers were entertaining thoughts of unit-body construction, while the styling staff was drawing inspiration from the design styling of the immensely popular Mercedes-Benz 300SL gullwing coupe. Drawing on inspiration from both Earl’s ‘56 Corvette and the Mercedes-Benz, a new concept car emerged that was featured at the 1956 Motorama that nearly became the basis for an all-new Corvette. 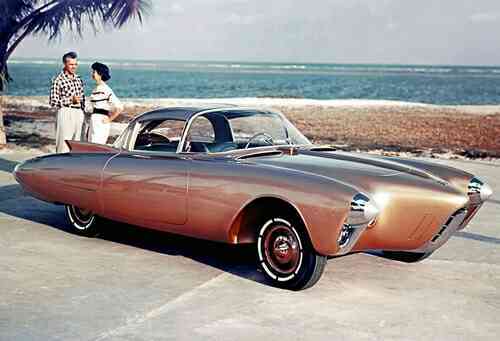 This car would go on to become known as the “Oldsmobile Golden Rocket”. This “Golden Rocket” was a unit-body, two seat coupe that sported futuristic styling that included a slim vertical grille and a protruding snout with quad headlamps – a style that was immensely popular amongst designers in Detroit. The Oldsmobile’s front fenders swept back the length of the body to a torpedo like rear end that was topped by small fins. 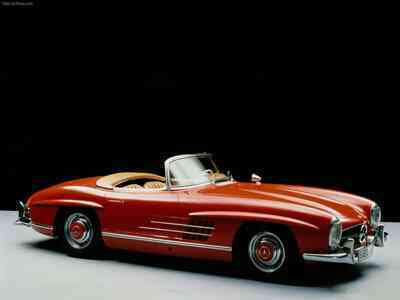 Gullwing-like sections were cut into the roof assembly to allow greater ease when entering/exiting the car. Much like the rest of the car, the roofline also tapered back in a “boattail” fashion, with a large rear window that wrapped down and around the roof. In all, the “Oldsmobile Golden Rocket” would become commonly recognized as the inspiration for Bill Mitchell’s Corvette Stingray seven years later. As early as 1946, General Motors executives had come to a consensus that unit-body construction would be the path forward for cheaper unit cost and higher volume, both of which were items that Corvette needed to begin turning a profit. Using the Oldsmobile concept car as a model, engineers began laying out a new Corvette based on the Golden Rocket’s styling. 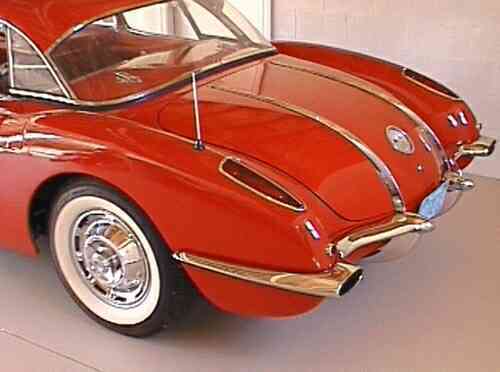 The rear chrome “suspenders” that are a key identifier of the 1958 Corvette. Early models made of clay and fiberglass showed how unit body construction might help pave the way for a whole new era of Corvettes. Smaller and lighter than the current C1, it also compensated for many of the current design constraints that current Corvette engineers were forced to deal with. However, this first pass at a new Corvette design never completely got off the ground. The project, which carried the name Q-Corvette, ended up getting shelved as members of the Concept Corvette development team were pulled away to other projects that demanded the attention of those who could best help in the ever increasing sales race against Ford. 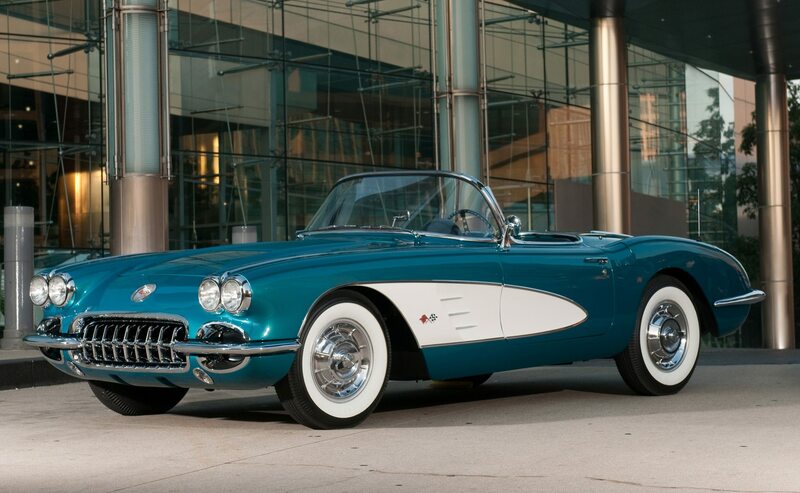 As far as the 1958 Corvette was concerned, the car would have to settle for a facelift. 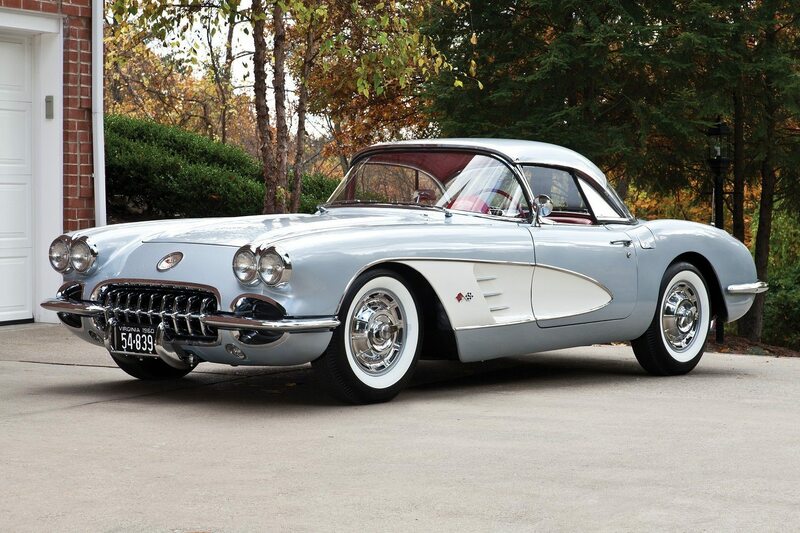 From the standpoint of appearance, the 1958 Corvette was far more excessive than any of it’s predecessors. While the car still reflected the design changes implemented in the 1956 and 1957 models, the ‘58 Corvette now sported simulated louvers on it‘s bonnet(hood), non functional air intake scoops on either side of the grille and phony vents in the bodyside “coves”. It also featured twin, chrome “suspenders” that ran from the base of the rear window down the trunk lid, before ending abruptly at the rear fender. Another notable departure from the earlier models was the addition of quad headlamps wrapped in a thick chrome bezel. DID YOU KNOW: As early as 1958, Chevrolet began developing the XP-700 Corvette as a prototype for the second generation ‘Vette. This concept model Corvette featured many styling elements that GM’s new design Chief, Bill Mitchell, believed would represent the future of the Corvette. Much like the chrome “suspenders” featured on the trunk lid, chrome stripran along the tops of the fenders, accentuating the appearance of the headlamps and giving an overall “swept back “ appearance. 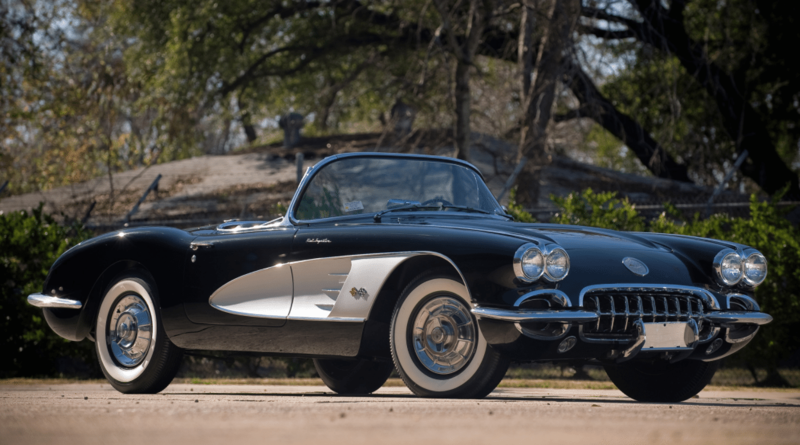 Lastly, the chrome “teeth” in the front grille itself were reduced from thirteen (as had been the standard in all Corvettes prior to 1958) to only nine. The 1958 Corvette not only looked heavier with it’s many new additions and design changes, but it had actually gotten heavier. 1958 Corvette Front End with quad headlamps and faux hood louvers. For the first time in Corvette history, the car exceeded 3,000 pounds, which was an increase of 200 pounds over the 1957 model. However, the increase in weight was not merely due to the excesses that were included in the car’s makeover, but was the result of the increased size of the car. 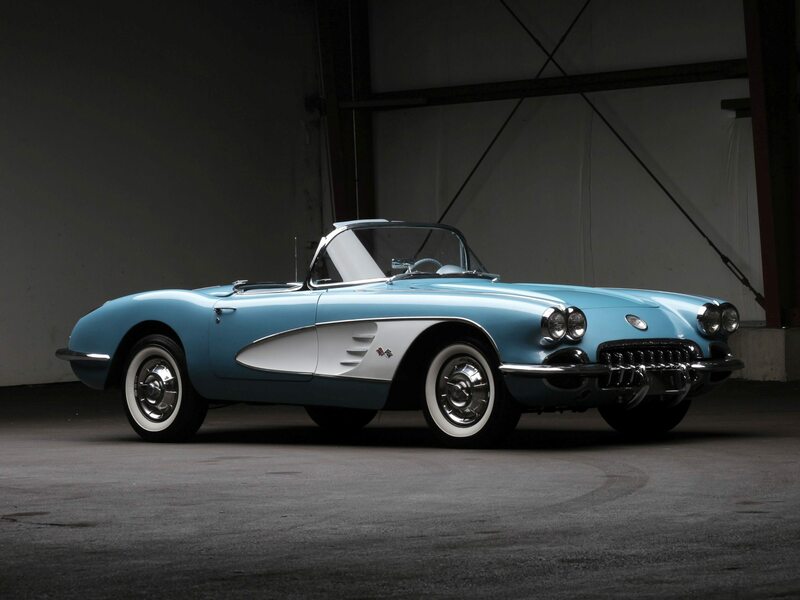 The 1958 Corvette had 9.2 inches of added length and 2.3 inches of added width, bringing the car’s overall dimensions to 177.2 by 72.8 inches. 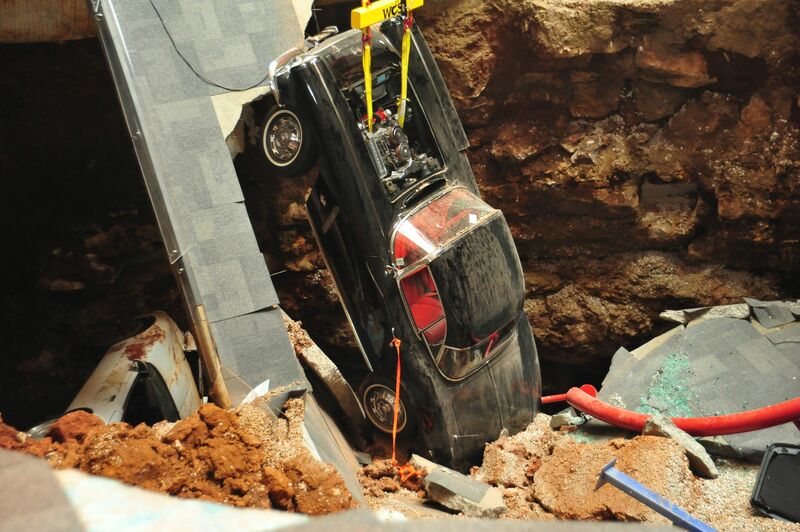 Because of the increase in weight and size, the Corvette would require the addition of radius rods to the rear suspension, which would help offset some of the behavioral issues the car experienced under hard acceleration conditions. While the exterior revisions to the 1958 Corvette exuded excess from almost every angle, the interior revisions to the car were no less substantial, although they were better received. A significant redesign of the instrument cluster at the request/direction of Zora Arkus-Duntov resulted in all of the gauges (save for the clock) to be placed directly in front of the driver in a binnacle. After the repeat criticisms of instrument placement in earlier models, this change seemed only natural to the Corvette’s design team. The new cluster consisted of a 160-mph speedometer which dominated most of the dashboard, while a smaller 6000 rpm tachometer was placed ahead of it on the steering column. Flanking the tachometer on each side was a pair of standard instrument gauges that monitored fuel levels, oil pressure, engine temperature and battery charge. 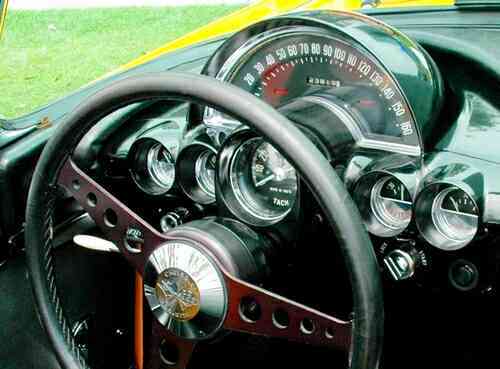 1958 Corvette’s Re-Designed Instrument Cluster. Emerging from the dashboard and mating with the center console was a narrower, vertical console which housed the heater controls, the clock and an optional “Wonder Bar” signal-seeking radio. While relatively unique for it’s time, this arrangement of controls was virtually identical to the standard layout in automobiles today. The passenger side of the dashboard featured a grabbar mounted in front of a semicircular dashboard that was cut away from the bar itself, allowing passengers to “hold on” in the event of a sharp turn or during sudden acceleration. 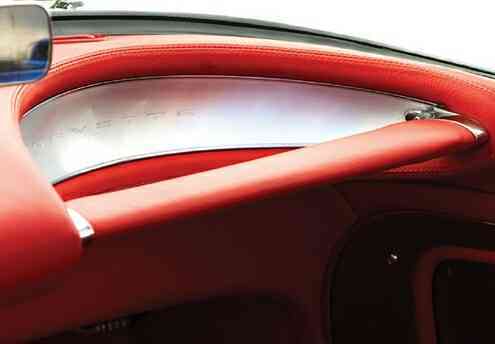 A locking glove compartment was fitted between the seats just below the release button for the convertible top. Other changes were made to the interior as well. The interior door panels were remodeled to include reflectors that had been added at arm level for nighttime safety. Upholstery now featured a new “pebble grain” fabric. Even seatbelts, which had been practically unheard of before that model, were standard issue – factory installed in the 1958 Corvette. 1958 Corvette Dashboard Passenger Side Grab-Bar. Regardless of personal opinion surrounding the 1958 Corvette’s appearance, there were no questions what the performance factor would be. 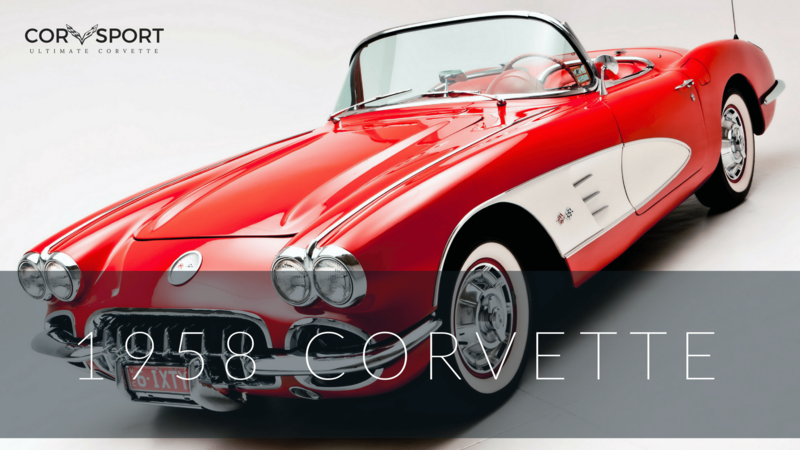 Nearly unchanged from the 1957 Corvette, the ‘58 continued to utilize the 283 engine. 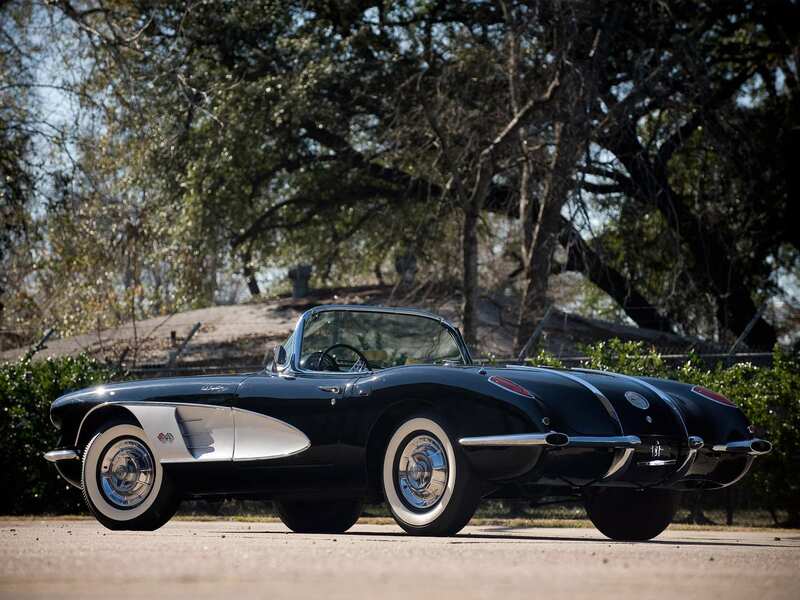 Now officially rated at 290 horsepower (at 6,200 rpm’s), the fuel injected, Duntov-cam 283 continued to flourish beneath the hood of the 1958 Corvette as the top level engine for that year’s model run. Similarly, a twin carburetor version of the engine continued to be offered as an option, offering drivers an uncompromising 270 horsepower engine. Despite this fact, few buyers opted for the carbureted version of this engine. Surprisingly, it was the base level 230 horsepower V-8 engine that buyers sought out. This base model engine was installed in nearly half of the 1958 models. 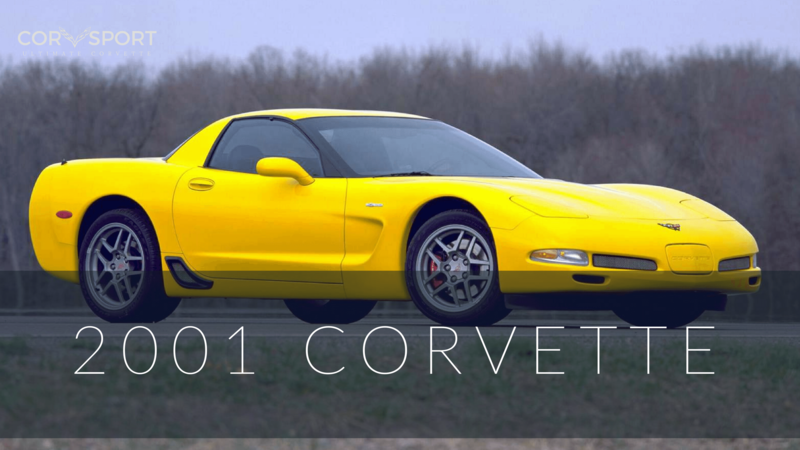 Only 1,500 Corvettes were actually fitted with the fuel injection option, and of those only 1,000 featured the 290 horsepower setup, the other 500 belonging to the 250 horsepower version of the Corvette. 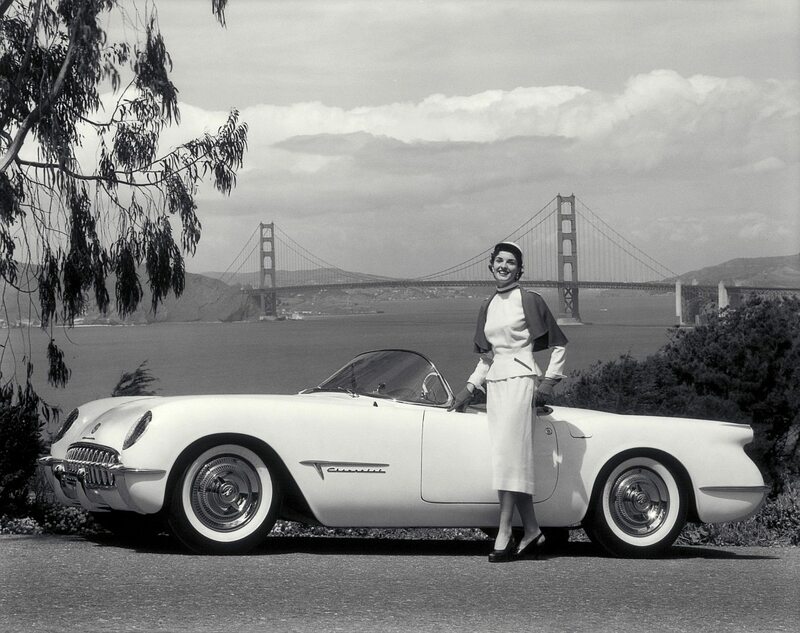 For those enthusiasts that had continued to demand uncompromising speed and performance after the introduction of the 1958 model, Chevrolet continued to offer a near race-ready version of the Corvette, which they made available at local dealerships across the country – and at prices that made buying even the highest end Corvette affordable. With upgrades ranging from a high performance, 290 horsepower, fuel injected engine, Positraction, heavy-duty metallic brake and suspension and a four speed manual transmission, the total difference in cost between the base priced Corvette and it’s racing counterpart was about $1500.00. 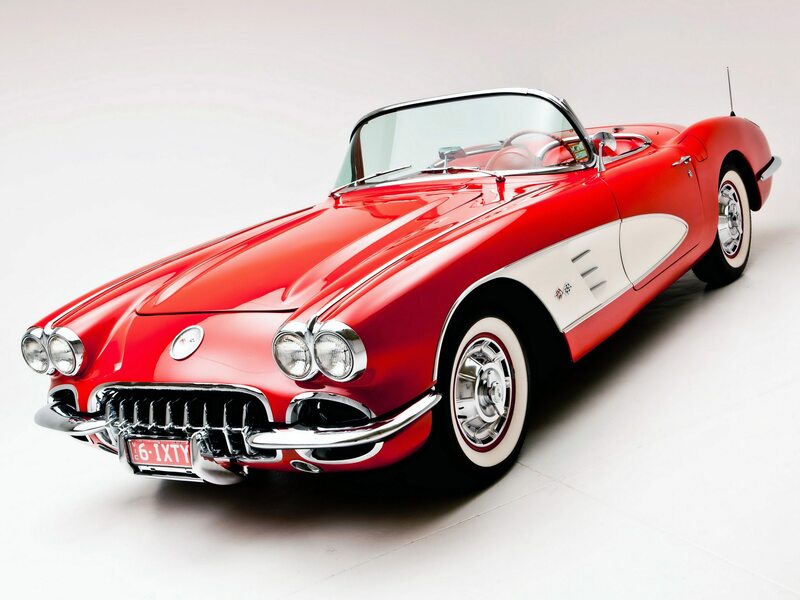 Despite some of the extreme changes to it’s body styling, the 1958 Corvette was the first vintage of Corvette to turn a profit for General Motors. 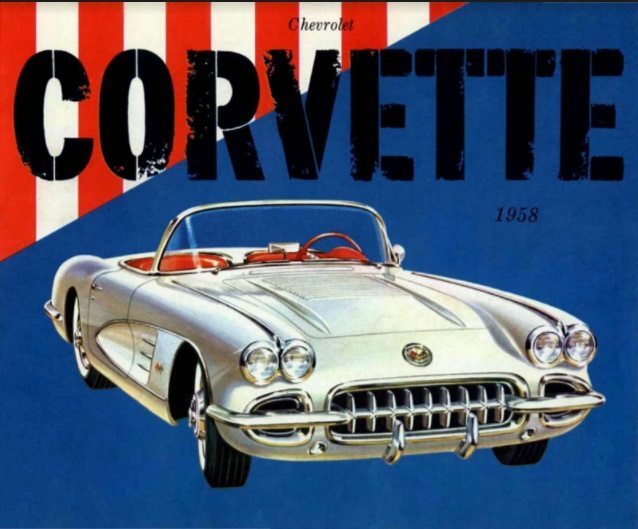 In all, Chevrolet sold 9,168 Corvettes in the 1958 model year, which was doubly impressive when considering that the Corvette sales were up (47% over the 1957 Corvette and a staggering 150% over the 1956 Corvette) despite a year in which a financial recession had wrought havoc on the competition, leaving few manufacturers to actually turn a profit that year. In fact, save for Ford’s new four-seat 1958 Thunderbird (and very few others), Corvette alone proved successful in the domestic automotive market. 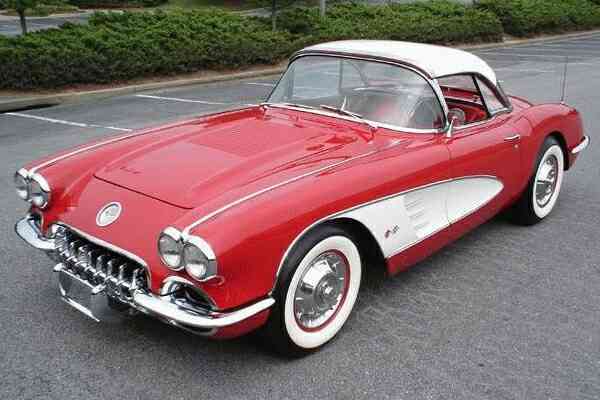 The 1958 Corvette was longer, had twin headlights, and was actually heavier than its predecessors. Diameter Free 13.45; working [email protected] 1145 lb. – Capacity At pad = 575 lb., At ground = 725 lb. J (First Digit) General Motors Identification Code for Chevy Corvette. The last six digits begin at 100001 and run thru 109168, accounting for each of the 9,168 Corvettes built in 1958. Each Vehicle Identification Number (VIN) is unique to an individual car. For all 1958 Corvettes, the location of the Vehicle Identification Number (VIN) is located on the driver side door post. The VIN is also stamped on several locations on the Corvette frame. The base price of the 1958 Chevrolet Corvette without any optional equipment. This base option price included a 283 cubic inch, 230 horsepower V8 engine, 3-speed manual transmission, vinyl interior trim, and a soft top. Corvette featured non-functioning louvers on the hood. Heater (101) – An interior space/.cockpit heater. A standard Delco, signal seeking AM radio with conventional volume and selector bars. The AM Radios for the 1958 Corvette are transistorized. Most 1958 selector bars for the signal-seeking feature included the word “Wonderbar”. The windshield washer reservoir for the 1958 model was supplied by Trico. It was a hard, white, plastic jar with a red lid. Optional wheels that were one-half inch wider than stock. Featured small, passenger car hubcaps instead of standard, full wheel disc covers. For 1958, the wheels may have been painted black (in some instances) instead of silver. Although the Auxiliary Hardtop is shown as an option, customers could swap the convertible top for the auxiliary hardtop at no additional cost. 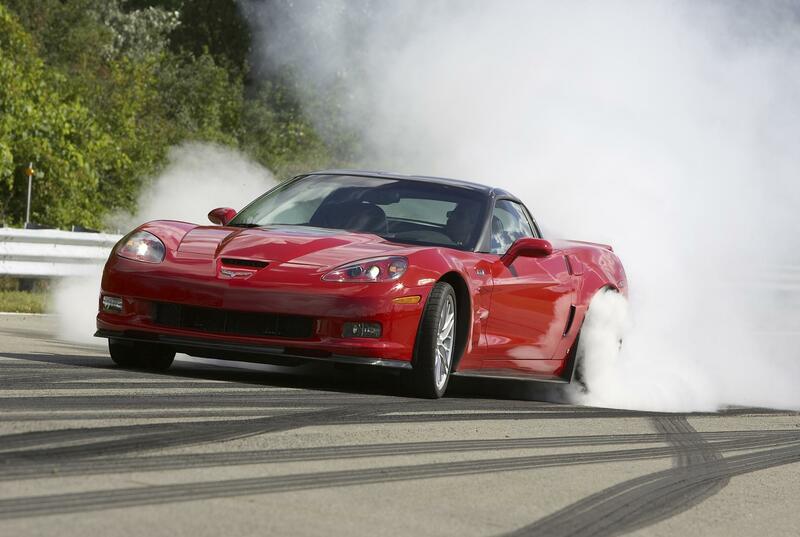 Of the 5,607 Corvettes sold with this option, 2,215 of them were the result of this substitution. The charcoal exterior color is believed to have been replaced by black sometime after the midpoint of 1958 construction. 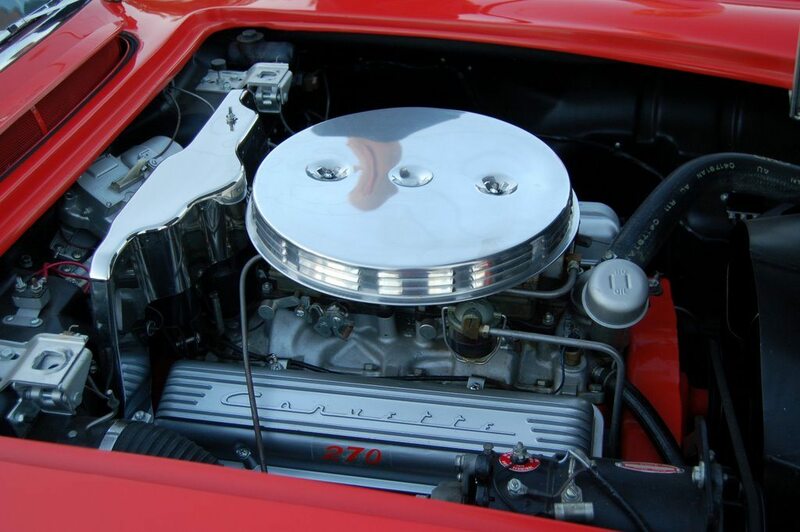 2,436 of the 1958 Corvettes were built with this engine. 978 of the 1958 Corvettes were built with this engine. This option required a three- or four-speed manual transmission. Electronically controlled convertible top that could be automatically raised/lowered. Unlike the 1953-1955 Corvette Roadsters, which had an optional top that could be attached to the car, this convertible top was an integral part of the design, allowing the 1958 Corvette to be classified as a true convertible. A “high output” version of the standard 283 CI, 230 HP engine. 504 of the 1958 Corvettes were built with this engine. 1,007 of the 1958 Corvettes were built with this engine. This engine option required a three- or four-speed manual transmission. Higher performance gear ratio designed for increased acceleration and driveability. 1,123 ’58 Corvettes included this option. 2,518 ’58 Corvettes included this option. 370 ’58 Corvettes included this option. 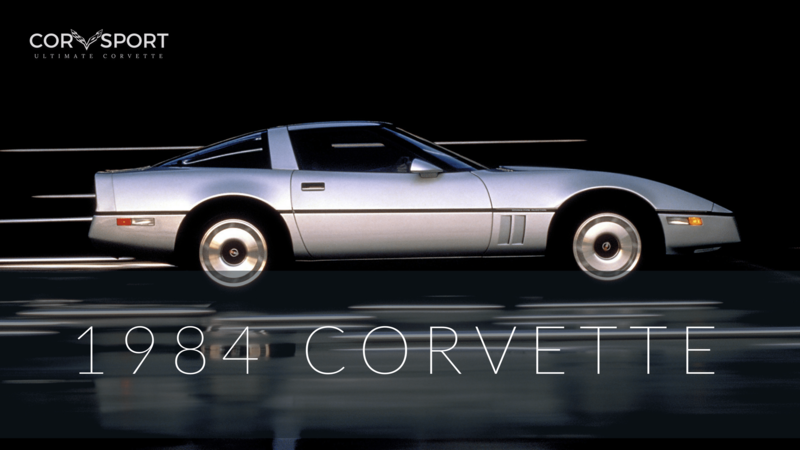 Of the 370 Corvettes built with this option, 75 had a three-speed manual transmission, 295 had a four-speed manual transmission. Modified suspension system featuring a number of performance/handling upgrades. Included special front and rear springs and shock absorbers, a heavier front stabilizer bar, quick steering adapter, metallic brakes, finned brake drums, fresh air ducting to rear brakes, and front brake air deflectors (except for very early production-year models). 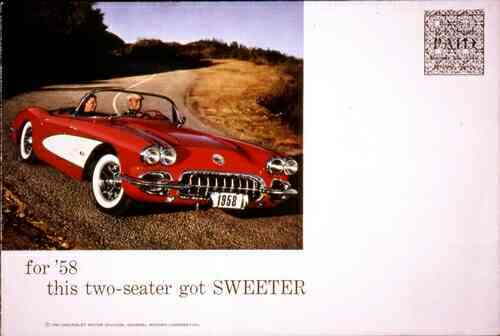 Download this 1958 Corvette Dealers Sales Brochure for a quick look at the features of the car.